Great Gulf views from the 10th floor screened-in balcony and both bedrooms of this Sanibel Harbour condo! 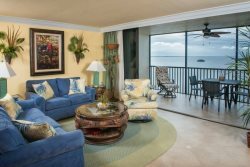 This condo on the Gulf is very nicely decorated with an appealing color scheme. Grey plank style tile floor upon entering through to the balcony with granite counter tops in the kitchen and bathrooms. Both bedrooms are carpeted and a spacious master bathroom shower with double vanity sinks. There's a king in the master and two twins in the guest bedroom, sleeping 4. Our rentals close to Sanibel Island are in a convenient location, providing easy access to South FL travel. You may have found this rental on HomeAway 4787904, HA ID 4787904, VRBO 4787904, or Vacation Rentals 4787904. I stayed here for a conference and it was fabulous! Our condo was spotless, dolphins jumping outside the screened in balcony and I felt safe my whole trip! I would highly recommend! Our stay in the Bay View Tower was perfect! The views are sublime and the amenities on offer including the private beach, pool and nearby hotel are fantastic. Its in a brilliant location convenient for Sanibel and travel elsewhere. We thoroughly enjoyed our stay and cant wait to return. A wonderful experience at a spectacular location and property. I had an excellent experience working with the staff At Resort Harbour properties. I was able to add a day to our vacation with ease. Everyone was very friendly! We loved our stay at the Bayview Tower 1032. This was our 6th time staying here and 1032 was the best unit yet. Very nicely decorated with a great view. We will be back!! The team are wonderful. So helpful and cheerful and a pleasure to deal with. Hurricane Matthew was threatening Florida before we left for our holiday so I contacted the team for advice and they were extremely helpful, sending me a useful link so that I could monitor the situation and also sending me updates. We consider ourselves 'frequent flyers' at Resort Harbour Properties as we visit twice yearly whenever possible. It never fails to provide us with a relaxing and pleasurable vacation. Our next flights are already booked and we are already looking forward to 2017! The team could not be more friendly or helpful. Really genuine, nice people. An absolute pleasure to deal with them. We had a really lovely stay with you. The condo was absolutely perfect for our needs and the views from the balcony and bedrooms are just breathtaking. Genuinely my favourite place to come and stay. It's peaceful and relaxing and everyone is so friendly and welcoming. It feels like a home from home after 15 plus years of visiting!!! Thank you! The office team are so helpful. Always cheerful and willing to go the extra mile.